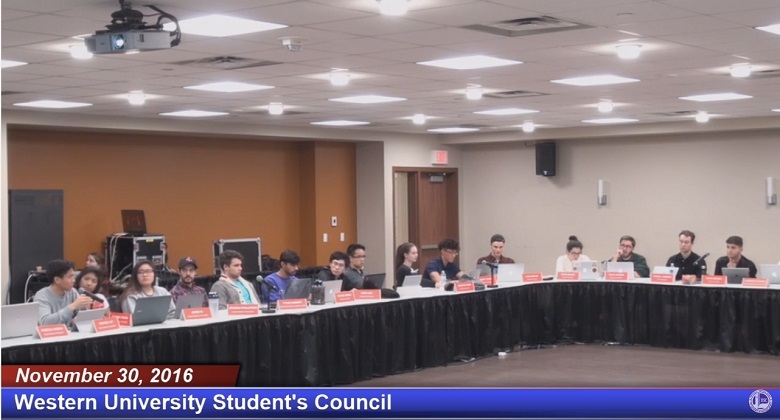 As a advocacy group: Student council members advocate to the university administration, local groups, political bodies (on all levels of Canadian government) and police to get the best deal for students and make sure their voice is being heard. As a service provider: The USC maintains a variety of commercial operations to provide quality service to students. This includes two campus restaurants, a movie theatre, a clothing store, a bike shop, a printing shop and more. The USC also facilitates the student health, dental and buss pass plans. These initiatives, combined with the many events (such as concerts, speakers and festivals) make up most of the organization’s budget. As a student leadership developer: The USC offers hundreds of paid and volunteer positions for students at Western. These can include internships with business managers, working closely with the student executive, and volunteering on one of the many programming or service files. The core of the USC will always be student leadership and decision-making. Broadly, the Board of Directors is responsible for overseeing the corporate sides of the organization. They are assigned with approving Council’s yearly budget and assessing financial risks or opportunities. Other important functions include developing strategic plans to assist the USC in fulfilling their obligations to undergraduate students, as well as participating in the development of the USC’s organizational plan and annual review.